Literally hundreds of books have been written for pilots working towards certificates and ratings of fixed-wing aircraft. But while working on getting his helicopter instructor certificate, author Ryan Dale saw the need for more resources specific to aspiring helicopter pilots. The Helicopter Oral Exam Guide was written to do just that. Based on the highly popular Oral Exam Guide Series by Michael D. Hayes, this book prepares pilots for the oral portion of their Helicopter Checkride for Private, Instrument, Commercial, Flight Instructor, and ATP. Helicopter pilots can now use this guide and the corresponding OEG book to get the rotary-wing knowledge specific to their training needs. The Oral Exam Guides by Michael D. Hayes were written to help prepare applicants for their oral exams with FAA examiners. Using a question-and-answer format, each guide lists the questions most likely to be asked by examiners and provides succinct, ready responses. Pilots will find these guides indispensable tools in both planning for what to expect during the airplane checkride, and mastering the subject matter. Instructors rate them as excellent preparation for students, as well as preps for Instrument Proficiency Checks (IPCs), aircraft transitions, and as general refresher material. Updated to reflect the latest regulations and procedures, this invaluable resource serves as a supplement to ASA’s Oral Exam Guide Series. 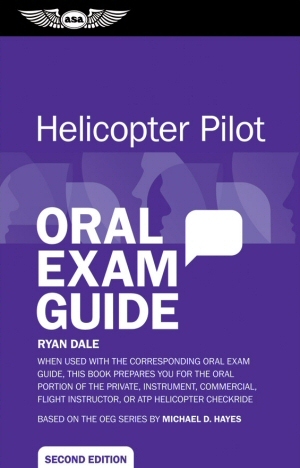 When used with the corresponding oral exam guide, this book prepares students for the oral portion of their private, instrument, commercial, flight instructor, or ATP helicopter checkride.Arranged in question and answer format, this guide takes the questions most likely to be asked by examiners and provides succinct, easy to follow responses. Instructors consider this to be excellent preparation for students, as well as a general refresher for previously certificated helicopter pilots.